I absolutely love coffee. It is my one addiction; I’m comfortable with that. However, I found that this addiction had gotten a bit out of control and that it wasn’t making me feel as good as it once did. I’m an only-cream-in-my-coffee kinda girl, but that little bit of cream was causing my belly to ache and my partner to banish me into the other room, not to mention the beating my adrenals were taking everyday from the caffeine. So I did some research on how to make coffee “better” for me, because as I just admitted, I wasn’t going to give it up. What does this mean? Basically, starting your day off with just a cup of coffee, whether black or with cream and sugar (a worse offender), means that you are going to create adrenal fatigue and increase body fat. Two things that will eventually lead to disease and dysfunction. Add good, high-quality fat to your coffee. It improves performance, increases cognitive function and helps to decrease body fat. Sounds too good to be true, doesn’t it? It’s not. I swear by this recipe and have put hundreds of my clients on it with great results. Part 3: Why does adding fat to my coffee make it better? Fat doesn’t have a hormonal consequence, meaning when you consume high-quality fats, you will not spike insulin levels. By eating fat with coffee (or anything that stimulates a stress or insulin response), you can help mitigate some of the harmful effects. 1. 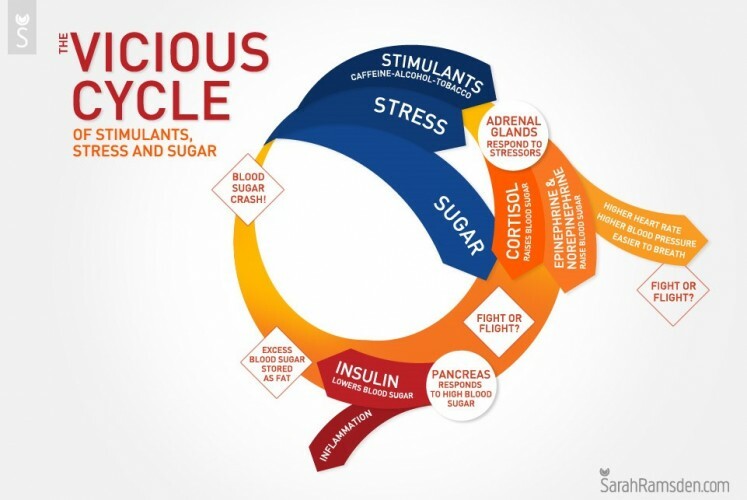 Metabolically you control your insulin response, resulting in balanced blood sugar levels which will prevent excess sugars being stored as fat. 2. You feed your brain, which functions better on fat than sugar, improving your cognitive functions while getting your caffeine on. 3. Grass-fed butter contains some really good stuff: fat soluble vitamins, minerals, Conjugated Linoleic Acid (CLA) and Omega 3’s which will all nourish your body. • Start with 4-500 ml (2 mugs) of black coffee brewed with mold-free Upgraded Coffee beans. (Why this is important). You can purchase local beans by finding a local roaster that knows where their beans come from and how they are processed. You want a single bean source, not a blend, to make bulletproof™ coffee. • Add 2 Tbs. (or more, up to 80 grams, about 2/3 of a standard stick of butter) of Kerry Gold or other unsalted grass-fed, organic butter. (Might want to leave this out on the counter so it’s soft. Do not soften with microwave). You must use grass-fed butter. You might want to start off with only 1 Tbs. of grass-fed butter and 1 Tbs. of coconut oil to start. If your body isn’t adjusted to dealing with this amount of good quality fat, it can cause some GI discomfort. Taking digestive enzymes can help with this, as well. Remember, no cream or sugar — just butter and oil. If you need your coffee to taste sweet, try adding a small amount of vanilla extract or stevia or xylitol. For more information about Bulletproof™ Coffee, check out my blog. Richelle Melde is the Fitness Expert for News Channel 12 EVB Live show (Phoenix, Ariz.) and has been seen on Fox, CBS, NBC and ABC, as well as in the AZ Republic and Business Journal. She has a B.S. in Psychology, Sociology and Women’s Studies and is a CHEK Practitioner and Holistic Life Coach. Posted March 24th, 2014 & filed under Health.